– Which page has the most keywords associated with it? Data about your pages and what happens on them is incredibly useful, especially so when you consider that it is pages which users are actually interacting with, and it’s also the thing you have the most control over. We start by showing you pages in a list, opting to give you a preview of the SERP so you can spot any issues right from the first page. We count the number of keywords this page has been linked to by Google, showing it in search. We show you some top level stats like average position ranked, total impressions, clicks and CTR. We show you which technical page issues there are for each page. 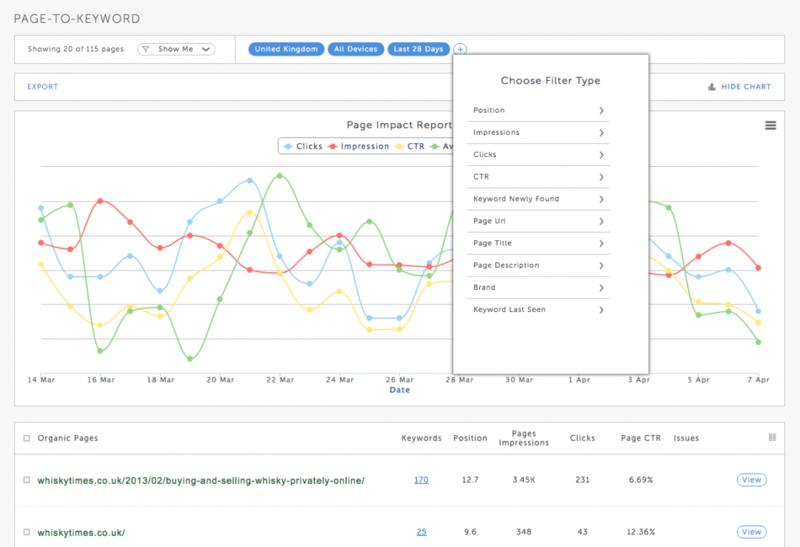 Using all this data you can quickly see which pages you need to prioritise first for maximum traffic gains.